A special drying process is necessary for finishing green pieces immediately after de-molding and this process is also called “leather drying”. This process is already well tested: instead of draining the humidity as it happens in the traditional systems which has incidence on the Bigot diagram for shrinkage, produces a temporary superficial evaporation capable to harden the piece sufficient enough for its finishing. This temporary superficial drying lasts for 25 to 50 minutes depending on the type of piece and also on skills of the operator assigned to the finishing activity. The removed water corresponds to 0,5 -1.5 % in the formula on the dry base as per the total weight of the piece. 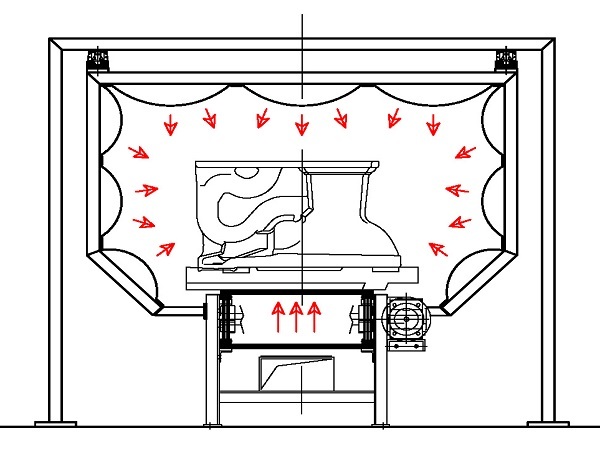 The process is controlled through a PLC as it needs an upgrading and downgrading temperature curve so as to avoid a thermal shock of the piece.After the shaping phase the piece reassume its natural homogeneity due to the widespread raising of water towards the surface as a consequence of the steam tension difference.